Is Today's CIO Tomorrow's CEO? IDC recently said that virtually every big organization will soon be a software company, capable of churning out its own code and sustaining its own digital existence. Here to lend credence to that forecast is a hefty report from Deloitte University Press which dots the “i” with a focus on CIOs and their job descriptions as of late. The CIO (chief information officer) and CEO (chief executive officer) roles are beginning to blur, according to Anand Sahasram, Chief Information Officer at McGraw-Hill Financial. In an interview for Deloitte’s CIO Program, part of an expansive conversation with and among leading CIOs worldwide, Sahasram stresses that business today is so technology-driven that CEOs will soon start to acquire data skills while CIOs will be in a position to lead transformation and indeed the company itself. So, either one can become the other, but then why have two people for the same job? Disruption is skill is as important as anything else. However, only 9 percent of the 1,200 CIOs surveyed by the consulting firm said they had all the skills required to succeed. Subjects were asked to select the top five competencies that a successful leader needs, then to identify their own top five strengths, to ultimately reveal the gaps between their responses – essentially the skills they lacked. Another trait that up-and-coming CIOs are being forced to borrow from their CEO brethren is communication. Mike Brown, VP of ExxonMobil’s IT division remarked that if you’re not an effective speaker, chances are you’ll be a lousy leader, including in IT circles. Fig. 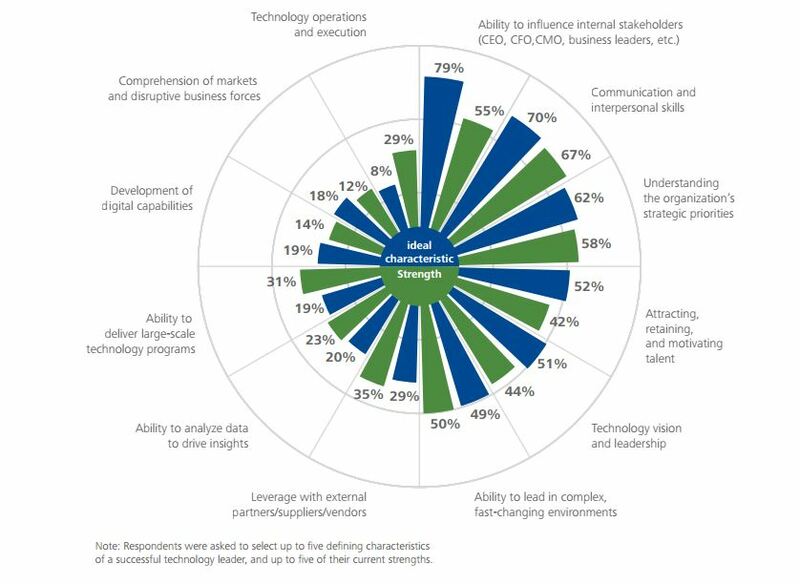 3 (picture above) from the 70-page report outlines the current CIO strengths against the ideal characteristics of a successful chief information officer. There much room for improvement in some areas, but the writing is on the wall: the CIOs and CEOs of today are like two peas in a pod, and soon they’ll merge into one.